Energetic, sensitive, gentle, and talkative, the beautiful Korat, with its enormous eyes and silvery fur, is considered a good luck symbol in Thailand. A natural breed native to Thailand, the Korat (named after a province in Thailand) is also known as the Si-Sawat cat because its fur is the colour of sawat fruit seeds. Korats, which are associated with luck and prosperity, are often given as presents to those of high esteem. The gift of a pair of Korats to a bride is believed to ensure a fortunate marriage. The Korat, whose ancestors are Thailand’s wild jungle cats, received its first historical mention in The Cat-Book Poems, written between 1350 and 1767. In later years, as Thailand (formerly Siam) engaged in continual warfare with its neighbours, the Korat likely survived because the colour of its coat provided camouflage in the granite-dense areas of Thailand’s Phimai District. The Korat was not brought to the United States until 1959. Today, breeders in the U.S. and Norway supply the majority of European and North American Korats, though there are also breeders in other countries. All purebred Korats can trace their lineage back to Thailand. The most notable features of the Korat are its oversized, prominent green eyes and its soft blue-gray fur with silver tipping that creates a gleaming halo effect. 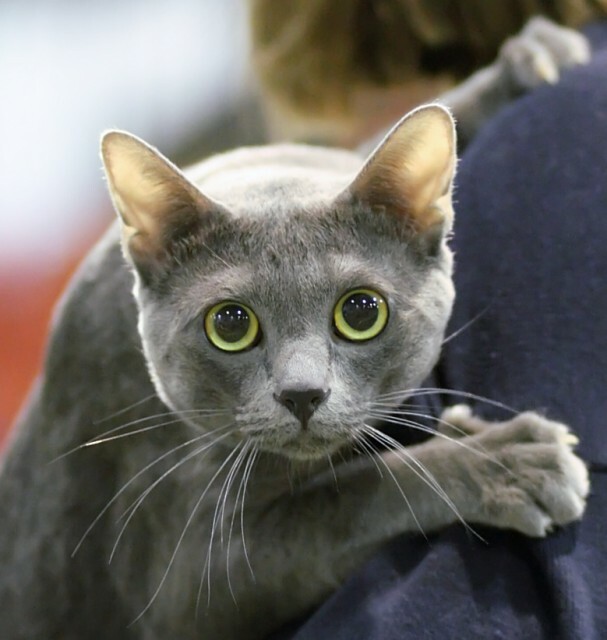 The Korat’s hair usually doesn’t float off when the cat is stroked, so some allergy sufferers are able to tolerate the breed. The Korat has a heart-shaped face with a short nose and large ears. Its body is medium-sized, compact, lithe, and supple, built for strength and endurance, with a medium-length, tapering tail. At maturity, most males weigh 8-10 pounds and females 6-8. Affectionate and cuddly, the Korat likes to spend its time with people and requires a lot of attention. Although often rambunctious, most Korats are also cautious and gentle. They tend to be very careful with people, and most try not to cause any physical harm when playing. The senses of the Korat are exceptionally powerful, and they are particularly sensitive to sights, sounds, and smells. Because of this, they appear to be more traumatized by sudden, harsh, or loud noises than other cats. This timidity can usually be reduced by playing a radio in the nurseries of Korat kittens to expose them to various sounds from an early age. Due to their sensitivity, Korats are not an ideal choice for homes with very young, noisy children, though they are very good with older, quieter children. Korats will usually bond with one particular person (or sometimes another pet) in a household, though they are open to interaction with others. Korats also get along well with other cats, assuming that they have the upper hand in the relationship. The very high intelligence of the Korat makes it amenable to training, and many will take to leash walking and playing fetch with toys. Sensitive and people-oriented, these cats should never be scolded as part of their training. Undesirable behaviour can usually be discouraged with either a firm “no” or by ignoring the cat for a brief time. The Korat is among the more chatty cats, and can be somewhat loud and demanding when it wants attention. Korats have an impressive vocal range, beyond the basic meows of many other breeds. Korats are highly sociable and don’t do well on their own, so this breed is not a good choice for people who live alone and spend a significant amount of time away from home. Anyone who is planning to adopt a Korat should get two so that they can keep one another company. As a breed that evolved entirely through natural selection, the Korat is quite robust and healthy overall. Anecdotal evidence suggests that indoor Korats enjoy particularly good longevity, with many reaching 15 years of age or more. The only genetic disease that has been associated with the Korat in the past is Gangliosidosis. However, DNA testing has been used to eliminate this problem. Although they are slow-maturing, requiring several years to reach full size, anecdotal evidence from breeders suggests that some Korats can procreate as young as 4 or 5 months of age, so early spaying or neutering is recommended. Korat prices depend on bloodlines and other factors. Pet quality Korat kittens tend to cost around $400, and show quality even more. Due to their relative rarity, Korat breeders usually maintain waiting lists. When choosing Korat kittens, keep in mind that they commonly go through an ugly duckling stage when young, with amber eyes and darker, fluffy coats. The appearance of a young Korat doesn’t necessarily indicate what it will look like upon reaching maturity. To adopt an adult Korat in need of a loving home, contact the Korat Breed Rescue or visit PetFinder’s list of shelters that have Korats available for adoption. Purebred Korats are only available in blue-gray; there have been no attempts to introduce other colours into the breed. Baird, Camilla, Korat World. (2006). “Living with a Korat.” KoratWorld.com. Cat Fanciers’ Association. (12 June 2009). 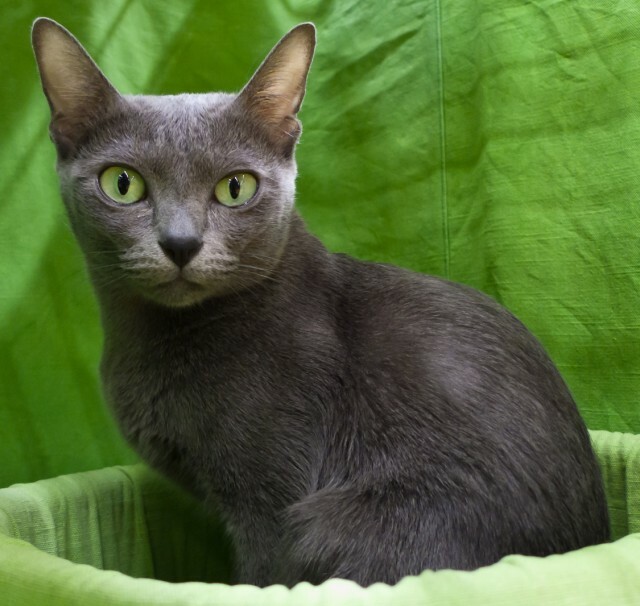 “Breed Profile: Korat.” CFA.org. Cherkas, Julie, The Korat Cat Association. (n.d.). “The Korat: Standard of Points.” Korats.org.uk. Ganoe, Dennis. (26 April 1996). “The Korat.” Korats.com. Lacey, Jen, The Korat Cat Association. (n.d.). “Breed Profile.” Korats.org. Langford, Doris A., Korat World. (2006). “The Korat’s Health.” KoratWorld.com. Negus, Daphne, Korat World. (2006). “The History of the Korat Cats.” KoratWorld.com.